In the early 80’s when lighthouses were being torn down or boarded up Rheta had a dream of building one on the island in their pond. So, blueprints were drawn only to be rolled up and placed in a corner like a soldier waiting for his next command as the years passed. Rheta wondered how and when they could afford to build the lighthouse. Meanwhile she heard the song Ron Hinson wrote about the “Lighthouse”- suddenly the vision of a “Pretty Image” took on a “Spiritual” tone. She felt that God was in the vision and knew that he had a plan, but what was it? So she waited. Meanwhile the family field sale turned into a large Festival. 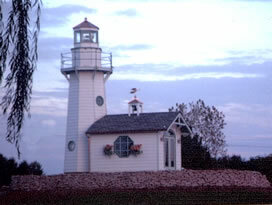 One day, while Rheta was in the field on her golf cart checking the field for rocks, sticks, and other debris, the Spirit of God spoke to her heart so loud â€“ she almost heard Him,- saying “Put 10% of the Gate Fee each year in savings and wait.” She knew it was for building the “Lighthouse”. Now she knew how to pay for it but not when to start building. She cried a few tears of joy and thanked Him for “His sweet spirit and word of knowledge.” Many years passed as she patiently waited for the Lord. 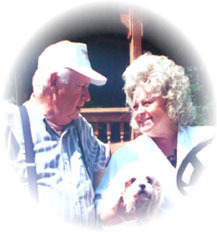 In September of 1999 one of her sons (DeLayne) built a building on the grounds for his Furniture Refinishing and Custom Woodworking business. Also that year, the island was cleared of over-grown trees, old bushes, and other debris. Then one day Delayne came to the main house and asked if he could have the blueprints. Rheta’s heart leapt for joy as she wondered “Lord, is it time?“ And it was! DeLayne decided to ask help from two of his friends, Mark Cash and Jerry Bryd, that work in construction and between the three of them they decided the “Lighthouse” should be taller and the chapel larger then the original blueprints. DeLayne’s next step was to build a scale model to show the planning commission. 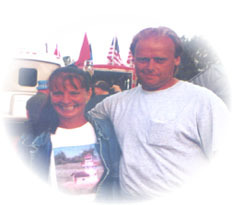 Then after October 11, 2000 DeLayne & wife, Shawne, went to work. First DeLayne built the tower, in sections, inside his building. At the same time he was looking for the beacon light and focusing on every little detail that needed to be done. Then in April 2001 the 2500 watt (that’s equivalent to 253 million candle power) beacon light arrived from Italy. Then one day in July, the big crane arrived to lift the 6 sections up on the hill; what a thrill! While family & friends watched with anticipation & awe the tower was completed. By spring of 2002 DeLayne & Shawne started on the finishing touches of the Tower and Chapel. Then began the work of the Rainbow Bridge located on the south side of the island. After many tons of dirt, flat rock, large boulders and landscaping materials were put in place the Gloryland Lighthouse Chapel became a one of a kind sight for its area.